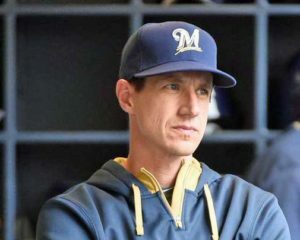 Milwaukee Brewers manager Craig Counsell completed his five-man starting rotation on Thursday. Following opening day starter Jhoulys Chacin, the Brewers will go with Freddy Peralta, Corbin Burnes, Brandon Woodruff and Zach Davies. Davies has been slotted into the fifth spot, while the order in which Peralta, Burnes and Woodruff appear is yet to be determined. Chase Anderson is the odd man out and will start the season in the bullpen. Burnes pitched out of the bullpen for the Brewers last season, making 30 appearances and finishing with a 7-0 record and 2.61 ERA. Woodruff bounced back and forth between the Brewers and their Triple A affiliate. He ended up making four starts and 15 relief appearances, finishing 3-0 with a 3.61 ERA. Peralta appeared in 16 games with 14 starts, finishing 6-4 with a 4.25 ERA. Davies won 17 games in 2017, but rotator cuff inflammation last season meant just 13 starts and a 2-7 record with a 4.77 ERA.